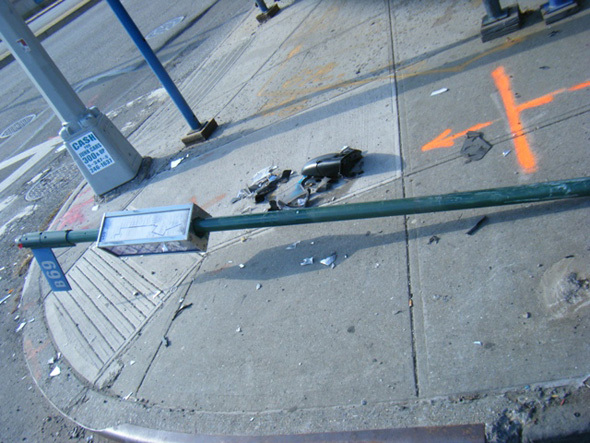 In what’s starting to be an annual tradition, Streetsblog’s first reader-submitted photo of 2012 shows a bus stop pole brought low by the impact of a motor vehicle. 2011 got off to a similar start. This is the B69 stop at Vanderbilt and Atlantic, a stone’s throw from where Forest City Ratner and the Empire State Development Corporation want to build an enormous surface parking lot, beckoning people to drive to the new Barclays Center arena. The motorist who slammed into this pole had to drive across the Vanderbilt Avenue bike lane before wrecking city property. NYPD’s public information office had no details about the incident, which indicates that any bus riders or cyclists present at the time of the crash escaped with their lives intact. Before the holidays, we caught word of three other curb-jumping incidents in Manhattan, at least two of which were known to have caused serious injuries. Not even the sidewalks are safe from driver recklessness. Meanwhile, City Council Transportation Committee Chair James Vacca spent the end of 2011 on a media tour talking up his commitment to bike enforcement. This crash occurred in the 88th Precinct. The commanding officer there is Deputy Inspector Anthony Tasso. If you’re concerned about traffic safety and want the 88th to do something about it, you can bring it up at the next community council meeting. The 88th Precinct community council meets on the third Tuesday of each month. Locations vary. Call ahead (718 636-6526) to confirm meeting dates and times.